It will be Ebay if we fail to grab something so all is not lost. I see stuff on there from last year's festival. No problem Slade. I have no dout these shirts are going to be quite a hit at the festival this year and I cannot stress enough that when they're gone, theyr'e gone. Unless there's some newfound significant demand, this is it. As for ebay, that depends on how many shirts are left over after the event and store orders. Just a friendly reminder, 2 more weeks until pre-orders close. Those two weeks will be gone before you know it so please make sure to get your orders in! I can't stress enough that I will not have large quantities to go around at the festival itself. KRF II LE Posters will begin shipping as soon as I get the USPS shipping tubes and is expected to be by next week. Thank you for your patience and your orders! Posters will ship domestic and international, 1-4 per box for the same flat rate. Pre-orders (pick-up) for KRF II event merchandise will close March 14th. I will then activate mail orders for t-shirts (domestic and international) on March 15th. I will be shipping t-shirts out in durable bubble wrap mailers which hold about two shirts each. If you order more than 2 shirts at a time, expect multiple packages but I will still honor my shipping discounts. Again I must underscore that I will have a very limited supply of merchandise availible at Knight Rider Festival II. Your best chance to secure your items is to place your orders through the online store unless I have informed you otherwise. So i got the call today that my car is getting picked up tommorrow for its trip to vegas for the fest. They are holding the car at there site till i get there and can pick it up at my leasure. Same thing going back home. Slade we will see I have 2 woman that want to ride with me. Been a busy day for me today prepping for KRF II! I went to the local library and signed all the prints of the poster and the USPS mailing tubes came in (about 20 boxes worth, yikes!) I will begin shipping out the mail orders for KRF II Event posters Monday! Until then enjoy some pics! 2 weeks till Vegas! See you there. I have been informed by Paul that tickets for the VIP party are dangerously close to being sold out! If you have any second thoughts to attend the VIP party or have not paid for additional guests, the window is closing fast! Get your tickets secured as quickly as possible! The VIP party will sell out and no payments for admission will be accepted at the door! Make sure you are on the list! Well it's been a long journey but now it's time to declare last call on purchasing pre-orders for Knight Rider Festival II. This is the LAST WEEK to get your orders in! Pre-Orders for event pick-up will close on Sunday, March 14th. If you haven't secured your merchandise or think you may want to purchase some at the event, I strongly suggest you get your pre-orders in as soon as possible. These 7 days will fly by and once the pre-orders are closed, that's it especially for event t-shirts which I have no doubt will be highly sought after with limited availibility. When pre-orders are closed, the mail order option for event t-shirts will go live. Please see the event site for more info about pricing and shipping. NOTE: If I have spoken to you privately about securing items for the event, you are ok. I will charge $20.00 per t-shirt and poster that I need to sell (which are not pre-ordered) at the event. This is due to conflicts with selling them on Fremont Street, I will have to make alternative arrangements to offer these items on site to fans who desire them. This includes the very limited items sold at the VIP party. If you want to save, please get your orders in! Remember partial proceeds from t-shirt and poster sales will go to charity. Please visit the site today to secure your order if you haven't already! Don't miss out! See you in Vegas! Nick, change of plan, I just placed a pre-order for both a shirt and poster. I selected my country for the shipping as I did not want to leave that field blank but I will be picking both items up from you at the event. Thanks, the items look real good! Where would I be able to find you at the festival? Friday - March 19th ~ 11:00 AM until 2:00 PM. - McDonalds window area located outside Fitzgeralds Casino Hotel near 3rd St. Stage. Saturday March 20th ~ 10 AM until 4:00 PM. - Knight Rider Companion table on Fremont Street in front of Gold Digger's Club balcony near 1st St. Stage. Slade - Yep, should be all set. As a special bonus I have decided for those pre-ordering an event poster, you will also receive a special "event exclusive" poster tube (white) to protect your poster while you enjoy the event and perhaps seek out those elusive signatures from the cast and crew. Here's a sneak peek at the special label inspired by the K.I.T.T. kit I have created for the tube. I will only have 50 tubes with me, when those are gone they're gone. I will still sell posters without tubes but if you want to have a special protector for your poster, the only gaurantee you have to get one is to pre-order a poster ahead of time. Okies..that's enough event merchandise promotion I think. The rest is up to you! I've been to Vegas a number of times but never to Downtown so I have no idea where those pickup locations are but I'll find them. just go to the companion table on saturday.. it's on fremont street right in front of the golden nugget. Yeah, that's the best thing. Slade, well, I was going to be wearing my KR Online t-shirt but I have lost it...temporarily that is but I doubt I will find it in time before I set off. It would have been good to wear to let others know I am part of the forum. As for a meet up, I'm travelling over with a friend so I doubt I can hang with others off the forum all day but if I recognise anyone, I'll be sure to say hello. Saturday March 20th ~ 10:00 AM until 4:00 PM. 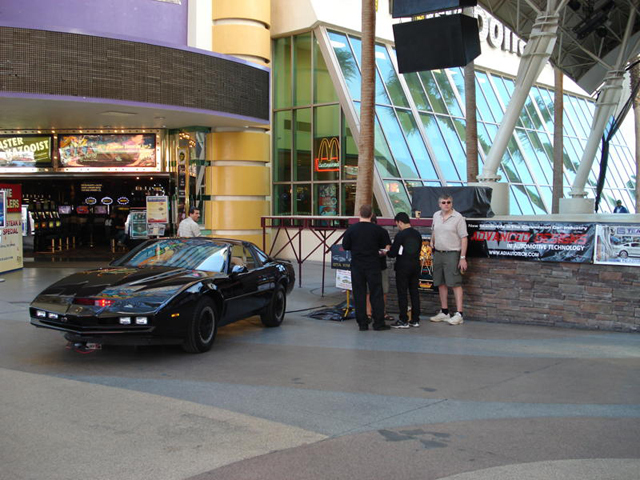 - Knight Rider Companion table (will have a banner) on Fremont Street in front of Gold Digger's Club balcony area opposite 1st St. Stage. The first pickup location looks easy as I can see it is by an entrance of the hotel. Thanks for the help, Nick!